Most of the philosophical literature on immortality and death -- at least that I've read -- doesn't very thoroughly explore the consequences of temporal infinitude. Bernard Williams, for example, suggests that 342 years might be a tediously long life. Well, of course 342 years is peanuts compared to infinitude! (b.) an ever-expanding range of experiences that eventually diverges so far from your present range of experiences that it becomes questionable whether you should regard that future being as "you" in any meaningful sense. Call this choice The Immortal's Dilemma. Given infinite time, a closed system will eventually cycle back through its states, within any finite error tolerance. (One way of thinking about this is the Poincare recurrence theorem.) There are only so many relevantly distinguishable states a closed system can occupy. Once it has occupied them, it has to start repeating at least some of them. Assuming that memory belongs to the system's structure of states, then memory too is among those things that must start afresh and repeat. But it seems legitimate to wonder whether the forgetful repetition of the same experiences, infinitely again and again, is something worth aspiring toward -- whether it's what we can or should want, or what we thought we might want, in immortality. It might seem better, then, or more interesting, or more worthwhile, to have an open system. Unless the system is ever-expanding, though, or includes an ever-expanding population of unprecedented elements, eventually it will loop back around. Thus, given any finite error tolerance, eventually events will have to get more and more remote from the original run of events you lived through -- with no end to the increasing remoteness. Suppose that conscious experience is what matters. (Parallel arguments can be made for other ways of thinking about what matters.) First, one might cycle through every possible human experience. Suppose, for example, that human experience depends on a brain of no more than a hundred trillion neurons (currently we have a hundred billion, but that might change), and that each neuron is capable of one of a hundred trillion relevantly distinguishable states, and that any difference in even one neuron in the course of a ten-second "specious present" results in a relevantly distinguishable experience. A liberal view of the relationship between different neural states and different possible experiences! Of course such numbers, though large, are still finite. So once you're done living through all the experiences of seeming-Aristotle, seeming-Gandhi, seeming-Hitler, seeming-Hitler-seeming-to-remember-having-earlier-been-Gandhi, seeming-future-super-genius, and seeming-every-possible-person-else and many, many more experiences that probably wouldn't coherently belong to anyone's life, well, you've either got to settle in for some repetition or find some new range of experiences that include experiences that are no longer human. [Clarification June 1: Not all these states need occur, but that only shortens the path to looping or alien weirdness.] Go through the mammals. Then go through hypothetical aliens. Expand, expand -- eventually you'll have run through all possible smallish creatures with a neural or similar basis and you'll need to go to experiences that are either radically alien or vastly superhuman or both. At some point -- maybe not so far along in this process -- it seems reasonable to wonder, is the being who is doing all this really "you"? Even if there is some continuous causal thread reaching back to you as you are now, should you, as you are now, care about that being's future any more than you care about the future of some being unrelated to you? Either amnesic infinite repetition or a limitless range of unfathomable alien weirdness. Those appear to be the choices. References to good discussions of this in the existing literature welcome in the comments section! Christina Van Dyke has fascinating work on this, basically arguing (if I'm wrong sorry about this Christina!) that Thomas Aquinas has a solution but we might be going to horn b of your dilemma. According to Aquinas, being in union with God is so wonderful it's the most wonderful experience we can possibly have, and we are so completely happy that it's a flow-like experience, so we'll lose any track of time. So we can go on doing this forever. Question is: are humans in such an eternal flow-like state of bliss still human in any meaningful sense of the term? Cool -- thanks for the reference. Kind of sounds like both horns a and b! One way out I didn't mention is to regard immortality as being outside of time rather than enduring infinitely within it -- associated with Augustine -- not sure if that's part of Aquinas's view. This makes me wonder about the macroscopic and microscopic effects. There would eventually be an accounting of every single neuron and with technology, every single gene. As an active counterpart to either epiphenomena and to the transcendent, she had a great point! It's no euphemism - the consciousness analogy of temporal infinitude to neumnotl hermeneutics - which I thoroughly praise. Process theism, like Whitehead perhaps, may denote one sense of that apprehension and dilemma in a positive light. I can find a few papers here. Then there is the cognitive approach. Memorable events give us a relation of cognitive abduction of the years in analysis of a lumpy convex curve - correlatives of stress and attention outlying relative decreases in perception of time passing over life - and that's what Qualia it enables whatever the subject may become. Prescient contingencies and prehension, ad infinitum, probably don't jive, here and now, the way they will in a bazillion years - real or not. So, that give us no real perspective. Besides, It makes for a tasteless false dichotomy. Either way, the catch-22 is that you are stuck being conscious or omniscient, what makes for a bumpy ride, at times, especially if it is starts rough or intermittent. I like this one best: dreaming and infantile amnesia explains it by analogies. These are still unknowns in the conscious experience. These are subtleties which don't quite fill the category of theistic or conscious; nor forever or 'forever and a day'. But if it were that I had to make the choice I'd dismiss up the math. Thanks for the comment and the cross-post, Matthew! I like the analogies to dreaming and infantile amnesia. I don't really agree with the ideas about what might happen over the course of an infinite existence - humans aren't closed systems, and I see no reason to think I'd turn into Gandhi at any point - but I do think that the point about the threat to identity is good. I think it goes beyond just the problem of human identity, though. It's not obvious to me that any object with infinite extension in any dimension can be easily defined and separated from the rest of the world. (This might be just because infinity is a bad concept which cannot be applied to the universe.) Those things in the universe which are infinite/last as long as the universe - we don't really call them "objects", we call them laws of nature, or the fabric of reality. The same seems to go for infinite spatial extension. The problem of other minds might become very acute when faced with an apparently human mind with infinite temporal extension. Once the mind has gone through a phase of being like Wowbagger the Infinitely Prolonged, it would start knowing an awful lot of stuff that us mayflies don't know, and conversing with it would become hard, to the point where it might not seem human any more. The problem with expansion in my view is that it assumes that adding more states yields ever more meaningful differences in experience. But look at say resolution, say 480p, go to 720p, go to 1080p, go to 4k, keep going. All the larger resolutions are either scaled up versions of the lower resolution content or stitching-up(mosaic-like) of chunks of the already seen content at the lower resolution. Say you exhaust all content at 1080p. Can you expect to find meaningful differences in the 4k set of images? Nope, the 4k consists of stitching up the 1080p images, and the 1080p images not only have zoomed up chunks of the 4k image but they also have scaled down, zoomed out versions of entire 4k images. At 4k you won't find meaningful differences, and this likely holds for all higher resolutions you go to. That is vision, basically the most important sense, scaling up eye sensors will basically not get you outside of the finitude of the possible, no more meaningful content differences can be extracted. The rearrangement of small sequences deals meaningful differences, but once you reach a certain threshold of sequence size up to which you've seen all sequences, further increases do not add further meaningful differences. You could say that, although I've not the math to show it, it is my intuition that a similar phenomena to what is seen in computation happens with regards to content. In computations, once you reach a certain threshold of versatility in the workings of a machine, that is universality, increasing the versatility of the machine beyond that does not allow you to compute things beyond the simpler machine's capabilities. I suspect that it is the same with regards to content, once you reach a certain threshold in the complexity of sequences you're dealing with, a certain length or size, further increases do not yield meaningful differences. Infinity in essence is bound by the finitude of the possible. Which refers to the hypothesis that there are a finite number of meaningfully different possibilities, and anything else is just rearranged combinations of these finite possibilities, that do not add any further meaningful difference. That said, even if you end up trapped within a loop for eternity, so long as you controlled the transition between states, it shouldn't truly matter that you repeat. The problem with mortality is not only that you die, missing out on many potentially pleasing experiences that you could controllably experience indefinitely, but that without certainty of the finality of death you do not know, for sure,if you will continue to exist in some manner outside your control. Immortality grants control and certitude(when accompanied with adequate technology or means), if you're in a pleasant state and can guarantee it indefinitely, one might consider the endless repetition pathetic in a sense, but I don't see why the lack of novelty must objectively and necessarily truly mean it would indeed be pathetic. You'd need a lot of infinity! I've heard if someone was shuffling decks of cards at the start of the universe and dealing the entire deck since the start of the universe, only about now would we start to get repetitions. And that's a fairly simple set of differing values! Chinaphil: I agree that you needn't turn into seeming-Gandhi at any point -- though the more excluded possible states, the faster the immortal goes into repetition or inhuman weirdness. I can see how that point wasn't clear in the phrasing of the post. I agree about Wowbagger (unless Wowbagger becomes Wowbagger the Small and Repetitious). On your last point, the immortal might respond in a human way -- but at some point that will require repetition, then, for that subsystem of the immortal. Callan: Yeah. Fortunately for my argument, infinitude is infinitely big! Check out also the estimated size of Borges's Library of Babel. I do think Callan's got a good point, though. Seeing as it would take many times the age of the universe before forced repetition sets in, it's not obvious how we could think anything very useful about it from our current, universe-bound perspective. I'm not sure why you seem worried by repetition. People repeat themselves all the time, and repeat each other. Many of us go through life with nary an original thought in our heads. I'm also still not convinced that there is repetition, because humans aren't closed systems. For me to be in state X while in environment A is different from me being in state X when I'm in situation B.
I think last time I talked about cows having virtually identical lives, and us not seeming to care much about how many cows there are. With people, it seems the same: if I was a trillion years old and I fell in love, the fact that I had also fallen in love 500bn years before doesn't seem to alter the moral value of my love this time. Even if I'd fallen in love in exactly the same way. I'm starting to think about it this way: quantity doesn't seem to have much relation to value, once you get beyond the quantity that is "as much as a person can take". Food - you can't eat much more than 3000 calories a day, and food can only taste so good. Love - once you're in love, you can't really be much more in love. Life - my life is worth exactly one life to me at all times. Even though I can labour on behalf of future me by running on a treadmill or working on an immortality serum, I can't experience the benefit of my future life now. All the benefit I get is from being alive in this moment. This is a bit of a theme on your blog. Are you trying to think about the question of repetition as a project? Has your suspicion about how conscious we are of our own selves led you to suspect that our moments aren't as valuable as they are often assumed to be? chinaphil: Yeah, trying to think through the value (or not) of repetition, partly in large cases but also partly in small cases: I have a story in which the character "uploads" into a tiny world in which he amnesically repeats the same awesome techno-dance moment over and over again with minor variations for a billion subjective years. There can also be realistic cases, e.g., an acquaintance whose mother had severe anterograde amnesia and kept begging to go to Vegas, saying she never got to go there anymore. So he took her, and they day they returned she was begging to go to Vegas again, saying she never got to go there anymore. On my agenda: the literature reacting to Nietzsche's eternal return. I do think it's possible that the universe is such that we have future counterparts who act out subjectively indistinguishable lives. Is the proper reaction, who cares? I'm hoping I can find a way to thread these thoughts together into a coherent view, but I still feel like I'm groping. This is part of what the blog (and your and others' comments) is good for! Well, once again I think that the maths makes a real difference here. There is already plenty of micro-scale repetition within this universe, and as you say, it's an interesting psychological problem when one person's ability to recognise repetition is significantly different to another person's - as with the lady with amnesia. But to me, that doesn't in itself raise very significant philosophical issues. It's just one example of variation in cognitive experience among many others. If you want to think about meatier versions of repetition, more global repetition, for example another Eric S with completely identical physical make up to you, then it's important to recognise that it's not something that can happen in this universe. Whether there's a big crunch or a long freeze, this universe will end long before that kind of repetition sets in, statistically. 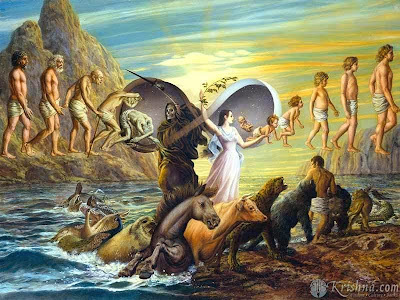 And seeing as we don't even know whether time can exist outside the universe, or whether the concept of "outside the universe" makes any sense, I can't see eternal return as a pressing problem. With your dance move, I suspect that much more of the value of a great move comes from the memory of it afterward and the appreciation of it by others than from the execution itself. If your uploader effectively stops being a person by removing himself from society, then will the move still have any value at all? Perhaps no more than a dog stretching. "you've either got to settle in for some repetition or find some new range of experiences that include experiences that are no longer human." And your point is? Being human is really important to me right now, because I am human. A half-billion years ago, when I was still getting used to this immortality business, it was really important to me to be a trilobite, and I could not imagine any set of experiences that did not involve filter-feeding in the mucky bottom of a shallow sea. A billion years into the future, I might be a sentient cloud of gas drifting between the stars and this human existence will be a brief interlude, best forgotten. Indeed, the ability to forget is essential to the life of an immortal such as myself. Oops, did I just give away my big secret? "Even if there is some continuous causal thread reaching back to you as you are now, should you, as you are now, care about that being's future any more than you care about the future of some being unrelated to you?" Of course not. You, middle-aged Schwitzgebel, are undoubtedly starting to take an interest in the affairs of seventy-year old Schwitzgebel. But that would have been unthinkable to five-year old Schwitzgebel, to whom seventy-year old Schwitzgebel was an utterly incomprehensible stranger. If half a century can make that much of a difference, then how much more does a millennium? An epoch? An era? Howard: Yes, there are some theologians who have discussed it. One potentially appealing way out is something like Augustine's idea that the afterlife involves existence outside of time rather than within time for an infinite duration. chinaphil: The views you express are all reasonable views, I think, but also I feel the pull of their negations. There are real philosophical issues around the value of amnesic experiences, and some possibility that we should care about post-Long-Freeze possibilities, and some possibility that the amnesic pleasure of the dancer is highly valuable when multiplied over a billion subjective years. In any case, thinking through these issues clearly with both require and clarify, I think, getting clear about what we think is valuable in human existence. Michel: Taken to the extreme, we end up perhaps caring only about the current moment? Arguably, the difference between NOW and any time past or future is metaphysically huge. What justifies the extension of prudential/self-centered caring into the future (or past), and how far does that extend? Classic issues, of course -- for example in Parfit. Yes, I suppose that's right. My position above doesn't exhaust the possibilities, and other options are worth exploring. But I have two worries about the specific angle you're suggesting here. First, I think introducing infinity is a bad idea. It probably doesn't exist, and it makes the maths impossible/much more difficult (for example, once you've got infinities involved, adding and subtracting utility becomes more difficult to handle: situation A has infinite utility, situation B has ten utils more, but the utility in both is infinite). Second, you talk about "getting clear about what we think is valuable in human experience," but I worry that in trying to take a "god's eye view" you forget (or even reject) a lot of actual human value. For example, Michel raised the good point that human appreciation of future value is bounded on the level of decades, and in many ways is roughly proportional to our age. And it seems like you kinda dismissed it by saying, taken to the extreme, that would mean we only care about the present. But I wouldn't want to take it to the extreme - humanity doesn't exist at the extreme. It seems to me to be a very pertinent fact about people that we are neither infinitesimal nor infinite; we are in fact decades long. chinaphil: Your second point is well-taken, though I think there can be room for a variety of perspectives. I'm particularly interested in the ethics of concern only about the present because of the character in my story "Momentary Sage" who has that point of view -- so I mean to think of it as an interesting point along a continuum of views that are worth evaluating. Your first point I'd turn on its head. Infinitude is cosmologically plausible. (Non-infinitude is also cosmologically plausible.) And part of what makes infinitude interesting is that it is so different from finitude! The math is unintuitive, but not impossible. Thus it's worth trying to think about rigorously. Some pretty similar arguments there! It wouldn't surprise me also to see some similar arguments in theological discussion and philosophy of religion (and a couple of people have sent me suggested references that I haven't yet had a chance to follow up). Like. That's pretty convincing. The maths will be hella hard, but I guess you're right, it's worth a go. "Given an infinite period of time, what remains possible during that period of time is certain to occur." This just isn't right. My maths teacher in secondary school put this very question to us: if you were to write out the value of an irrational number in decimal notation, is it certain that sooner or later you'd have the number 9? Yes, I replied, following exactly your logic: the decimal expansion of an irrational number goes on forever, so I thought you'd have to run into a nine sooner or later. He then showed, very simply, that there exists an irrational number in which 9 will never occur: 1.010011000111000011110000011111000000... And that's for irrationals, where repetition is not allowed. If a person existed forever, they probably end up looping around, in a longer version of your dancer and his move. Definitely no reason to think they'd turn into other people. Hart goes on: "It is hard to see how life that you wish to end gives life meaning in a way you would care about." But it's not hard at all. Many people in the world have felt suicidal, then gone on to have meaningful lives.